Home » Brain Function » Does Decaf Coffee Have Any Health Benefits? Caffeinated coffee has been in the health news a lot over the past few years. This morning beverage, affectionately called “leaded coffee” by some people, has been touted as a remedy for all sorts of ailments. Evidence has been building that drinking coffee helps diabetics regulate their blood sugar levels. 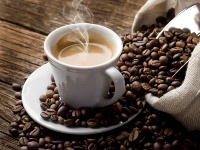 Other clinical findings for caffeinated coffee point to a possible role in the prevention of cancer. In all of this positive health news, however, not much is ever said about decaf coffee. Is it a healing food of the same stature as caffeinated coffee? Is it the caffeine in coffee that actually plays a big role in its healing effects? Most clinical trials studying coffee usually conclude with a caveat that it’s “unknown” whether decaf coffee exerts the same health benefits. This can be disappointing for the many people who can’t cope with large doses of caffeine on a regular basis. If you fall into this category, and want to know if your decaf coffee is boosting your health in any way, this article is for you. Researchers from the Human Nutrition Research Center on Aging at Tufts University, along with scientists at the United States Department of Agriculture, recently delved into the caffeine/decaf coffee conundrum to find some answers. They conducted a study that looked at how the polyphenols in coffee could potentially benefit the brain. Mice who were well into “old age” were divided into five groups. Each group was given progressively more coffee as part of their daily diet for an eight-week period. The researchers found that the mice that were given the equivalent of 10 cups of coffee (try keeping up with that!) performed better on cognitive and memory tests. Now, to determine if caffeine was responsible for these brain-boosting benefits, the researchers performed a subsequent trial. Basically, they determined that caffeine alone didn’t account for any of the improvements in cognitive abilities or memory. In other words, it’s likely the bioactive compounds in coffee boost your health. As long as your decaf coffee contains similar amounts of bioactive compounds (such as polyphenols), there’s no reason why it shouldn’t be just as good for your health as caffeinated coffee. Shukitt-Hale, B., et al., “Coffee, but not caffeine, has positive effects on cognition and psychomotor behavior in aging,” Age (Dordr). January 24, 2013.